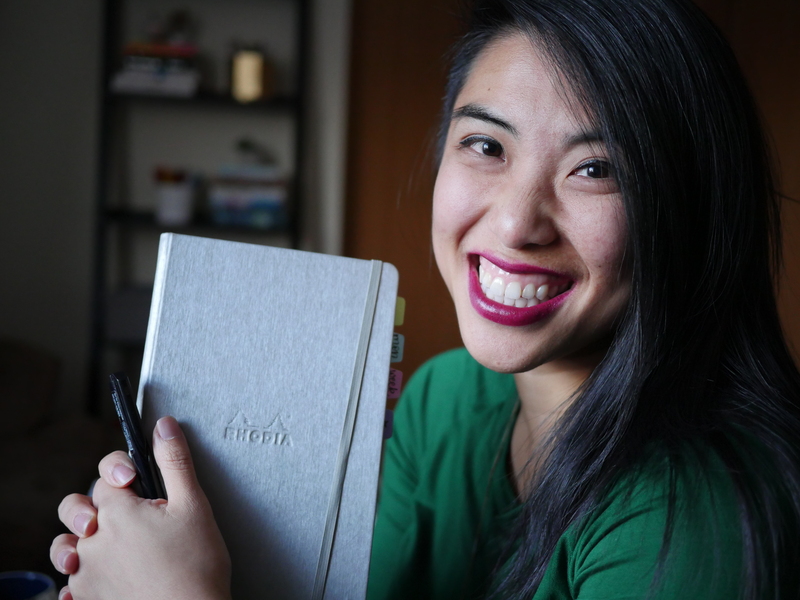 Every so often I have guests on the blog because I think we all benefit with more ideas and perspectives on how to use your bullet journal – today I’m happy to share words from Katie about how to let go of the perfectionism we hold onto sometimes in our bujos. Note: This post contains affiliate links, which means if you happen to purchase anything I’ll make a small commission at no additional cost to you – which helps me compensate folks for their time writing posts like this. Thank you for your support! I loved making those lists. There’s a feeling I got then and still get today when I dump the contents of my brain out onto paper in an organized fashion that is somewhat akin, I think, to a runner’s high. Oh, and that’s not even the weirdest list-making practice that I engaged in as a kid. I also kept notebooks (yes, plural) filled to the brim with pages and pages of all of the first names that I knew, catalogued in alphabetical order. I was obsessed with names, and I just loved writing them down. Isn’t it fun to be able to look back on our younger selves and muse at the ways in which we haven’t changed a bit? But anyway, back to bullet journaling. I knew I wanted to start, and I loved the idea of rapid logging. Then I started looking on Instagram for #bulletjournal and #bujo. You guys, those Instagram bullet journalers are insane! They’re amazing artists who also have a knack for planning and organization – and, of course, the most flawlessly gorgeous spreads always end up being the most ‘recommended’ by Instagram. I loved looking at these pages because they gave me so many ideas for formats and concepts I could try out in my own journal. There was only one problem: I can’t draw to save my life. I have a very unsteady hand. I don’t particularly enjoy art. And I’m also known among some of my more Type A friends for being laughably un-perfectionist – I’m the kind of person who’ll eschew measuring cups while baking. But monkey see, monkey do, right? I went out and bought my first bullet journal – a simple black Moleskine – as well as a bunch of colored pens and washi tape. For the first eight months or so that I bullet journaled, I tried so hard to make my pages aesthetically pleasing. Look at those lopsided Easter eggs! I switched to a new spread about halfway through this week because this spread wasn’t working for me for some reason. It’s not like I was beating up on myself for not being a good enough artist – not at all! It’s just that I was trying to be someone I wasn’t…in a bullet journal, of all places! I’ve since realized that my bullet journal is the place where I can absolutely be most myself. So why was I censoring or altering myself? This one makes my eyes hurt just looking at it! It’s way too cluttered for my brain to take in. Trying to make my bullet journal look too pretty wasn’t just taking up my time, either – it was actually hurting my productivity! These uber-fancy, elaborate pages weren’t set up in a way that would allow me to write out tasks in clear list form (which I’ve found is the way that works best for my brain). Instead, I was cramming all of my tasks into little boxes that were not easy to look at; and, worst of all, I would often quit using a spread halfway through the week (or pepper the page with extra sticky notes) because it wasn’t working for me. So, this is pretty much what my bullet journal looks like these days. I’ve switched to using a form of rapid logging with a rolling sidebar that shows what I’ve got scheduled that week. For awhile, I tried doing rapid logging on its own, but it always drove me crazy not to be able to see what I had scheduled three days down the road, for example. This way, I can see my week at a glance, then I just write out each individual day’s to-do list and scheduled events either the night before or the morning of. As you can see, I’ll also sometimes do little diary entries of something that happened that day (such as pitching this blog post to Jessica, hehe), but I don’t put any pressure on myself to do those unless I want to. As a freelance writer and graduate student, I also feel the need to always have kind of a master weekly to-do list at hand so that I can pull tasks from that each day that I feel like doing. For me, this system offers the perfect marriage of flexibility and structure. It may or may not work for you. Want more ideas of how to use the bullet journal for school? Here’s an idea of what my monthlies look like now, too. I forego color, decoration, and washi tape unless I’m feeling inspired. Have you guys ever heard of the philosophy of intuitive eating? Without going into too much detail, it’s basically the idea that honoring your hunger and eating however your body tells you to eat is the healthiest way to live. Well, I think what I now practice is essentially intuitive bullet journaling! Occasionally, I’ll get the inspiration to do a cool little doodle or attempt a funky-looking monthly design, but 95% of the time, my practical side wins out and I end up using a spread that isn’t too pretty, but just plain works…and that makes me happy! Now, I want to be clear – my ‘pretty’ bullet journal pages might be messier than your most ‘whatever’ spread ever; or, on the other hand, my plainclothes, functional pages might be more elaborate than anything you’d ever dream of sketching out. My point is, I guess, that we’re all different, and we all use our bullet journals for different purposes. And that’s why I love bullet journaling! It can be absolutely anything we want it to be; we set the definition. Now that I have a less rigid personal definition of what bullet journaling can look like, I don’t hesitate to recommend it to all of my friends – whether their organizational style is type A or more like type Z. I’ve yet to convert anyone, but I won’t stop trying! Katie is a freelance writer and aspiring school psychologist from Vancouver, Canada. When she’s not writing, studying, or bullet journaling, she can be found running, singing a cappella, or playing with her friends in their wedding band, the I Dudes. You can check out her writer website here. As much as I’d love to make my Bujo pretty I just don’t have the time. Mine is strictly functional. I don’t even do a monthly spread anymore. I just found I never referred to it. Now I just stick to a weekly spread with lots of room for note taking. I am with you all. Whenever I look at those gorgeous instagram spreads I start to hyperventilate. I am still trying to get into the habit of planning, and when I do create a weekly spread I will doodle and use colored pencils. The final product is my own and I enjoy looking at it. I reckon one of those people who analyses handwriting, doodles etc. would have a field day with your bullet journaling; could it be possible to deduce your state of mind from the design of your pages? Really great ideas. It is important to make your bullet journal something important and meaningful to you – not artistically or aesthetically pleasing to anyone else. Love what you have come up with. I recently bought a set of 12 bullet journal stencils off of Amazon. I’m not much of an artist and the stencils are helping me immensely, both with consistent images and they give me ideas in and of themselves. I’m still working on how to use them, but so far so good. This is an excellent article! Some things I will take to heart, others I will think about. I’ve changed the type of notebook I use four times since I started on May 29, 2017! That’s right, four books in four months trying to find what suits me best. I think I have finally found it because now I can do everything I want and I’m loving my bujo even more if that is possible!! Thanks for the inspiration ladies! It’s a great way to start my day, indeed, my week!! I make my bujo pretty (to me) by using coloured pens and stickers, that is enough for me. I love the system though because you can make it your own for what ever you need it for right now, which might change next week. I started in early 2016 using the original format. I was creating new habits and listed them to the right in my daily rapid logging. Water, steps walked, neck exercises, entering meals in my food tracker. I have daily routines. I have a list of tasks I try to accomplish each month to help me meet some goals. I follow FlyLady’s routines for keeping our home decluttered and clean and staying in top of the day-to-day tasks. And… I gleaned a few ideas from David Allen’s Getting Things Done to help me move forward with actions toward goals. I was writing many of the same things each day. So… I began using a spread with space for daily entries on the left and weekly tracker boxes on the right side page. Morning Routine, Habits, Weekly Tasks, Menu, Zone cleaning tasks (ala FlyLady), Next Actions, “Waiting For.”. I use a cheap graph composition notebook. My Bujo isn’t as fancy as those I’ve seen online. But when I feel like it – i do use washi tape on the page edges for collections and each new month. I use some gel pens. I find myself doodling in the corner of the page when I’m thinking about my next steps in the day. And… I may stick things onto pages as a memento. Thank you both for sharing these insights! 😊 I also fall into the trap of fancy pages time after time. And there’s nothing wrong with fancy pages, they do have a place in my bujo, but I have to keep remind myself that my daily pages have to be plain and simple, minimalistic and quick, or they will turn into a burden… I learned I have to save fancyness for my monthly pages (that are just skeletons at the beginning of a month and they serve as a creative outlet during the month, becoming fancy along the way) and my occassionally inserted fancy pages, shortly: do fancy when I feel like it, but keep the recurring dailies as simple as possible. The cool thing is, I turned out to be a minimalist and I find pages aesthetic for simply being well-arranged and clean. Thank you a tho.usand times for this post. I have wasted 100’s of hours on UTube and IG and got totally frustrated and felt like a looser. I have now found others that are as simple as me. Stickers, stamps, washi etc, help me feel better. I’m content! AMEN. Reading this, I felt bricks come off of my chest. SO many art filled beautiful journals out there, but they take serious time and dedication with little margin for error. My journals end up filling me with anxiety or guilt if I didn’t write perfectly or have the header aligned and sometimes we forget WHY we are writing stuff down in the first place. It’s fine and dandy if someone has the time to do all of that beautiful work, but if you are ignoring emails (like me) to carefully write out which ones to answer, it has become more of a distraction than a tool to help you be more productive. I think Eisenhower said it best…. Is this Important and Urgent? If you have something MORE important to do than decorate your bullet journal, than do that! Its not going in the Moma. Thanks for putting things into perspective. I love my bullet journal, but I had the same problem. I tried to make it pretty for a long time, but in the end, I’ve gone to bare bones just what I need stuff – and it works much better. That being said, I do draw in my headers, but only when I feel like it, and only when its fun. No one needs to add more stress to the day because they feel like their journal isn’t pretty! Great post!